Our product range includes a wide range of push pull gauge, pen type coating thickness gauge, cross hatch tester, digital surface profile guage, colorimeter and scratch hardness tester. Pushpull Meter is a force measuring instrument for both Push and Pull. There is ZERO ADJUST. An additional red pointer retains the maximum reading encountered. Law of weights & measures not applicable. Weights & Dimensions are nominal. Pushpull Meter is a force measuring instrument for both push and pull. RED POINTER retains the maximum reading encountered. By rotating it anti-clockwise set it to zero again. Because of gravity the METER when held inclined (or upside down) shows reading different then when held vertically. To nullify gravity effect, turn ZERO ADJUST holding the METER the same way as will be held while measuring. Spot calibration gives better results. Apply standard force ( the one nearest to the force to be measured), and with the ZERO ADJUST make the instrument read the value of the standard force. 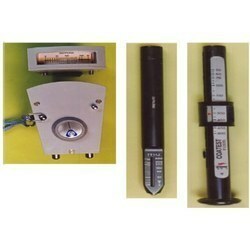 METERS with capacities below 2 kg. may require a light tap to overcome static friction. To prevent damages to inside parts, hold the pushing/pulling ROD firmly while changing accessories at its ends. Accessories : Stand with Holder - Slide. Measures the thickness of Non-magnetic coating on magnetic base. as Coating: Paint, Resineous coating. as Lining: Resin, Rubber, Fibre Glass. as Film: Plastic, Metal foils. This instrument is designed for assessing the resistance of paint or related coatings to separation from substrates when a right-angle lattice pattern is cut into the coating, penetrating through to the substrate. 1. Six working side blades:When the blade edge is not sharp enough, users can loosen the boat type nut and top thrust screw to change blade. 1. 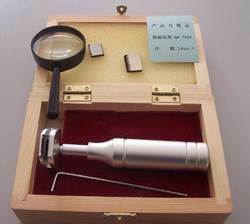 Profile Guage is used to measure peak to Valley height of the blast cleaned surface. 2. This is an important instrument in prepration of surface for painting application. 3. 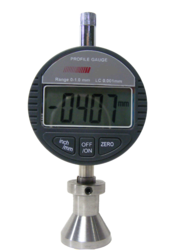 The profile guage is set to zero first on a flat surface . After that its kept on the surface to be measured . 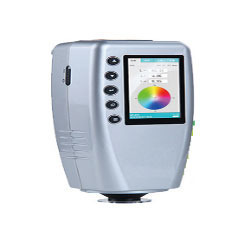 SAM-108 is Handheld Colorimeter which is compact in shape and size. The environmental friendly device consumes less energy and comes with the feature of automatic correction while starting up. A high capacity lithium battery is used for comfortable observation with real color screen display. 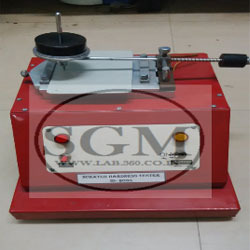 The Scratch Hardness Tester is used for scratch testing under specified loads. These are manufactured in compliance with set industrial standards using graded raw material. The testers are used to perform testing with increased load, which helps us in the determination of minimum coating penetration. The powder coated steel body of the instrument is resistance towards corrosion and it is high in performance. 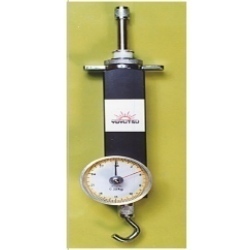 Scratch Hardness Testers are as per IS-101, weight set of 500 & 1 Kg. With needle, electrically operated model with full automatic system for to & fro movement and lighting system, as soon as light would be glow by scratch the slide would be stop, run by 220 Volt, Ac. at the inner rim of the die. In order to limit the indentation depth of the falling weight, distance rings of different thickness can be fitted. Also, different weights can be used.